Acquired from the Rowntree collection, August 1964. The helmet was originally a cuirassier helmet that has had the comb and other European decoration removed. The skull is of iron, now russet, made in two pieces and joined along the centreline. Attached below the iron skull is a band of hard leather that extends at the front and back to form the peak and neck-guard, the entire lower edge having an applied brass rim. The helmet from which it derives appears to be a French 'Minerve' style from 1810 - 1815. The basic helmet has been modified by decorating the skull with overlay in silver and gold, with Chinese immortals standing on clouds with other clouds and stars. Over the centre of the skull is an applied strip of brown / gold lacquered leather held in place by shakudo rivets with plain domed heads and four-petalled flower shaped heads. At the top rear is a 6 stage tehen kanamono of chiselled gilt metal that was originally designed, as shown by notches in its lower edge, for a helmet with five shinodare in front and two behind. From this runs a rounded shinodare in sentoku. At the front, the leather strip terminates in a pierced shakudo kanamono of chrysanthemums of the type normally found on the bottom plate of sode. On either side is a small gilt rivet having a mon head. A tsunamono is fitted in front. The lower part of the helmet is lacquered brown with a dragon on either side, facing each other on the peak. At the rear is a gilt ring and long purple agemaki. the Do is made from a mid-19th century French cuirass with recessed borders with prominent brass rivets. The borders are engraved with karakusa, the original shoulder fastening studs have been moved from the breast to the shoulder and the original holes folled with gilt rings. The original shoulder straps and chains have been removed and the brass fastening plate, again engraved with foliage, has been riveted to the shoulder straps so that they engage with the relocated studs. At the waist in front is an inverted brass hook, originally for a waist belt. The fastenings for the latter have been removed and the holes filled by modern blue cord. The front and back have been russet and decorated with sennin flying on ho-o birds, acolytes and clouds. At the lower front is a table with an incense burner and other objects. Inside, of both front and back, the surface has been coated with a thin layer of combed brown lacquer. Around the waist the rivets have been removed and replaced by loops of braid to take the gessan of seven sections, each of five rows of hon kozane, laced in dark blue with varigated mimi ito, uname toji and red cross-knots. 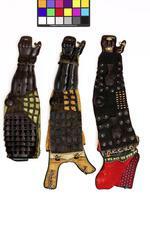 The haidate have at either side three large gold lacquered rawhide plates, hinged to each other vertically. Each plate is decorated by a lacquered dragon medallion in a slightly brighter gold. The armourered section is laced in red braid to the fabrics covered with a multicoloured brocade decorated with dragons and clouds. The suneate are of Bishamon suneate form made from 5 russet iron plates fastened to each other by dark blue silk crossknots. The knee-guards are in three section of kikko based on a purple woolen cloth with dark blue cross-knots and gold thread sewing. The fabrics are matching the haidate. 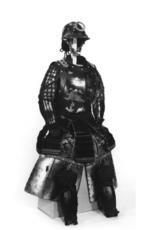 The armour retains a wakibiki to protect the upper chest and armpits. This example is of dark blue hemp cloth over mail and plates lined with the same fabric and edged with blue leather. It is fitted with a collar of kikko covered with blue leather with pale blue sewing but no cross-knots. There are attachment loops for the kote on the upper surface of the shoulders. The parts tie in front with mid blue braid whilst the armpit flaps tie with varigated braid. Dimensions: Kote length 685 mm, width 200 mm Weight: helmet 850 g, breastplate 3550 g, backplate 1650 g, kote 850 g each, gessan 1150 g, haidate 900 g, suneate 500 g (left) and 550 g (right). The origins of the European components of this armour are not obvious. The helmet is as mentioned in the description apparently French from the period 1810 - 1815. The cuirass on the other hand is a version of the Cuirassiers de la Guard Modele 1855 but with fewer rivets than that normally depicted ('Armes Blanches Militares Francaises - Aerienne) ' The mon on the rivets of the helmet, of four hollow diamonds in a diamond formation, enclosed in a circle is that used by the Yoshida and Yamashita families. Myochin Munenori, the maker of the sleeves, is recorded as being a retainer of the Tsuchiya clan working the in province of Hitachi. 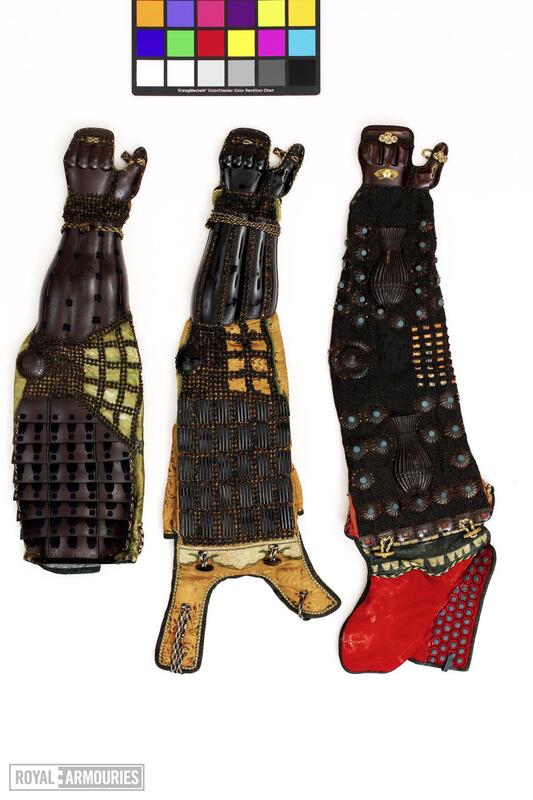 Kei Kanada Chappelear -' Japanese Armour Makers of the Samurai - Tokyo 1987' Following from the above, 'K.Sasama in Nihon no Gunso' depicts a senior commander of the 15th Tokugawa Shogun in the year 1865 as wearing exactly this cuirass with this number of brass rivets. It is possible that the cuirasses for these uniforms were already engraved. 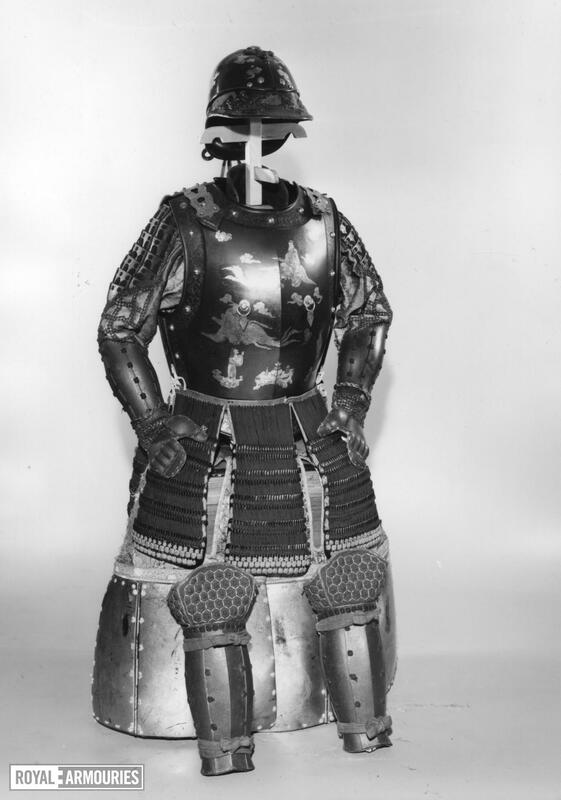 The helmet shown with the uniform is fitted with a front plate with the Tokugawa mon but could be the same as that on this armour. During a visit to Yasakuni Shrine, Tokyo in 1999, two cuirass of this type were seen in the museum. Neither had engraving in the borders although both were exactly of the type incorporated in this armour. The helmets used by the Japanese were not of the type used in the armour. They took the form of our Lifeguards helmets with a central plume-holder fitted with a horsehair plume. They appeared to have had the original 'grenadier' badge simple overlaid by the Tokugawa mon.